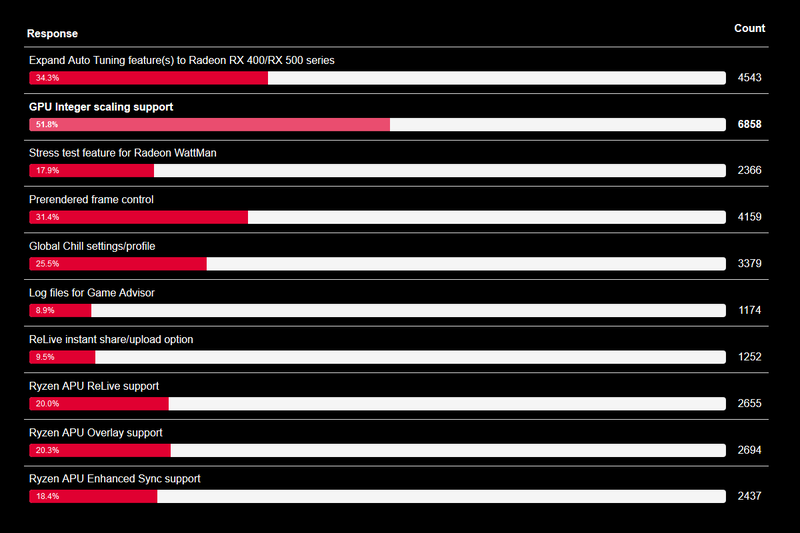 AMD's opinion about "integer scaling"
Not a long time ago a poll appeared on one of AMD's websites, which includes "Integer Scaling" as an option to vote for. As of 2nd April 2019 "Integer Scaling" clearly has the highest amount of votes. The idea itself is not new. The discussion about it started on Nvidia's forums in 2015 and now has 1141 posts (or 77 pages). Approximately two years ago an online petition was started and managed to collect over 2000 signatures so far. According to the best of my knowledge (correct me in the comments below if I am wrong) this is the most popular online petition regarding-consumer oriented graphics hardware so far. The petition on the 2nd place (which was all about Nvidia's support of adaptive sync) didn't get even close and only collected 190 signatures in a time period of one year. It appears that AMD's competitor Nvidia is not intending to add the feature in question any time soon due to technical reasons. Does AMD have any comments about their intention (or lack of intention) regarding making it possible to use the feature in question in conjunction with their products? I am sure that people who were asking for this feature for the last several years would love to hear AMD's opinion. I have no idea where either company is in making this a reality. I absolutely see the need for this. I use this tech in photo editing all the time so I can absolutely visualize how important this could be. Especially as we want to play older games not created for beyond 1080p on future tech. It seems only logical that this would be a next evolutionary step in GPU support. Time will tell. Maybe someone will know some current news. Thanks for the question and the share. This is a USER TO USER forum. You won't ever get AMD's opinion here. You would be far more likely to get it through redit or the persistence of a tech site asking them.